Lately I've been seeing a lot of work from home “jobs” for rebate processing. This immediately sends up the warning flag because when you think about rebate processing from home, what enters your mind? Sitting there in your pajamas, mindlessly typing basic information into a form, over and over. I'm not saying that there aren't work at home jobs where you can get paid to enter information into forms (see online data entry jobs), but you won't find many of them and there are rip-offs galore when it comes to this type of work. “Rebate processing” is no exception there. If you find one of these rebate processing job leads or land on a site for work from home rebate processing, you'll notice the site or ad makes it sound like this amazing, easy job. As described above, you'll be led to believe you're sitting there typing simple info into forms — and making fantastic money doing it. Usually the ad will say you're earning a set amount per rebate processed (likely $10 to $15 per rebate) and make you think you can do a bunch of rebates in one day. If you want to learn how to do this “job,” you'll have to pay a fee. In my many years of researching work from home jobs, one thing I've learned is that easy work almost never equals fantastic pay. If you want to make a decent rate per hour, most of the time you're going to be truly earning it. So there's your first red flag. The second red flag is the fee to get started. If you're ever asked to pay a fee to learn how to do a job that really shouldn't take much explaining, you should know you're being had! Most of the rebate processing jobs involve you promoting various products via affiliate marketing networks (most often Clickbank). If you pay the money to get started, you'll be told to create an account at Clickbank or a similar affiliate network and start posting ads all over the internet pushing products from that network. The affiliate network will pay you a commission if someone buys any of the products you're promoting. And — as promised in the ads you're instructed to post — you'll have to return part of the commission to the buyer of the product because your ads will include offers for rebates (an incentive to get people to purchase whatever you're pushing). This doesn't sound anything at all like what you signed up for, does it? The promise of making easy money filling out forms is actually filling out forms to create the ads you'll post online (most likely on Craigslist). The processing of rebates happens when you pay your buyers their cut of your commission. And your commission is going to vary — it will just depend on what the commission is on the product you're promoting. Most of the time it probably won't be anywhere near $10 or $15. We all know how hard it is to get people to sign up to buy anything! Affiliate marketing is NOT easy. You'll be lucky if you get one person per week to buy whatever you're promoting. Sure, you may be promised you'll make hundreds of dollars per week, but the truth is you'll be lucky to make $15 per week, if you make anything at all. 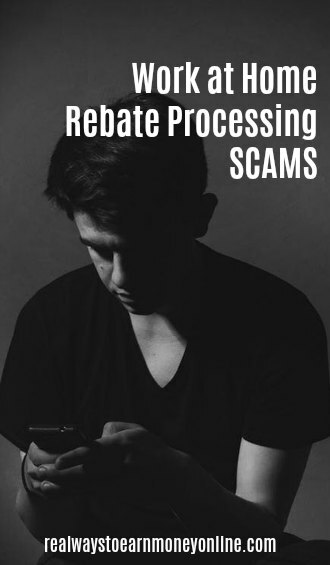 While affiliate marketing is definitely not a scam, you shouldn't fool with any site or ad posting offering you a “rebate processing opportunity” because they are misleading you big-time. They aren't telling you that what you're actually doing is affiliate marketing — they're making you believe you're doing an easy job from home. And no, these people don't care if you make money or not. The primary, all-important goal is to get that payment from you so they can give you the information on making money via affiliate marketing. And this information isn't going to explain to you how to do affiliate marketing the right way. Affiliate marketing can actually pay good money, but there's a right and wrong way to do it. There are entire websites devoted to it online as well as ebooks, blog posts, e-courses, and forums with all the info you need at little to no cost. “Rebate Processor” jobs are usually a complete waste of your time. Are there really any rebate processing jobs out there where what you're actually doing is filling out forms, processing rebates? Maybe. After all, these big, well-known companies that offer rebates on their products have to pay someone to do that, but those people may or may not work from home and I'd say they have other responsibilities, too. They probably don't just sit there and type information into forms all day. So please, the next time you see an ad anywhere for a job processing rebates, step carefully and definitely DON'T pay out any money to get a “job” like this. Looking To Avoid More Work at Home Scams? I keep a weekly list of openings from many reputable companies on my work from home jobs board. I also recommend trying a subscription to FlexJobs. This is a site I pay for and use myself. They post guaranteed legit flexible and/or remote job leads five days per week. I actually worked for a legitimate company. But I went to their place of business to pick up the rebates, bring them home, data enter them, then bring them back to the warehouse. They paid something like 12 cents each. But considering the amount of time put into it, 70% of the envelopes had 50+ UPCS, you were lucky to make $5 an hour. I did this for about a month and had enough. Just not worth it. They 1099 you if make over the $600. And of course, did not ask for any money up front. They were legit, just the pay is HORRIBLE. Really appreciate this article, I was looking into it and thought it was too good to be true. I couldn’t understand its practical need for someone to do that when it seems like a computer should be able to do automatic ship and rebate without the need of someone entering that information in. Anyway, thanks for the heads up.